I am a huge believer in moderation in nutritional health. This simply means to maintain a balance diet of vitamins and not overload on a single vitamin. And that makes perfect sense, both intuitively and scientifically. 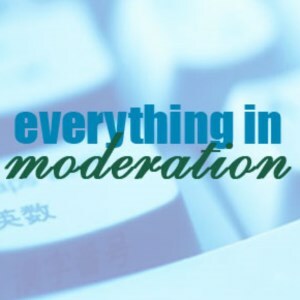 But can moderation also be applied to more than just nutrition? Can we live life in moderation and what are the ultimate benefits? For food, this choice is clear. Having a balanced diet for a majority of people is the most ideal. Having too much vitamin (either via food or pill) can be a waste because the human body can only absorb a certain amount before the rest is excreted. Additionally, too much of one vitamin over another might also prevent the absorption of other vitamins. For biking and running (and for most exercise related sports), they are fun in moderation. But I can't think of any reason (unless you are a professional athlete) that you'd want to push the limit. For biking, a 20 miles bike ride is fun, refreshing, and challenging. But (to me), 100 miles on a bike to complete a Century Ride is in part an accomplishment that one might check off their bucket list only because it's been promoted to the public as a life goal. The thing to be careful of when exercising for an extending period, you should be on the alert to repetitive injuries. Many people I know who ran multiple marathons only quit due to injury. Spending too much time behind a TV, or computer screen or cell phone in my situation, is also unhealthy. The constant glare into the eyes can be stressful causing dry eyes or other eye situations. I for one know that reading a long document printed on paper is much easier than reading off a computer screen. It is most likely why the Kindle is such a successful product. If there's one thing I could moderate more, it's spending less time behind a monitor. Alcohol is something I never really binged on, which I am okay with. I will have the occasional beer or glass of wine, but nothing more. Other than empty calories and some claims to health benefits for red wine, I personally don't see the appeal (outside of the social aspect).